During his two-plus years as a pro baseball player, Dwight Smith Jr. has run into a few Major League hurlers. One of his first bouts with a big leaguer came in Spring Training last year when he squared off against Yankees reliever Mariano Rivera. In that contest, Smith -- like many batters before him -- had his lumber shattered by Rivera's cutter. On Sunday, the 21-year-old got another cutter from a Major League All-Star, and unlike in his showdown with Rivera, his bat proved sturdy enough to handle it. Toronto's first-round pick (53rd overall) in the 2011 Draft took rehabbing left-hander Cole Hamels deep twice Sunday in Class A Advanced Dunedin's 5-2 victory over Clearwater. "It felt great," Smith said. "It's a good moment to hit off a big league pitcher. It always is. … Luckily, I just connected today." The multi-home run game was the first of Smith's career and was comprised of a pair of solo shots. The left-handed hitter finished 3-for-5 with two RBIs and two runs. It was the second time in the past two seasons that Smith had shined against a rehabbing big league All-Star. On May 9, 2013, Smith collected a triple and a single in two at-bats off Reds right-hander Johnny Cueto, who was fresh off finishing fourth in the National League Cy Young balloting. Smith, son of the eight-year Major League veteran by the same name, said having a father who played in the bigs helps limit the intimidation factor when he does face hurlers like Hamels. "When I faced Mariano, I felt star struck. I couldn't help that," Smith said. "For the most part, though, it helped me. … I just really take it as just another guy throwing." Smith's first homer came on a second-pitch fastball that Hamels left up in the zone -- precisely the pitch the Dunedin outfielder was looking for. The second came off what Smith perceived as a hung cutter. "He worked the count on me," Smith said. "He threw me all of his pitches. I laid off some and fouled off some others, then he hung me a cutter. That's the one I connected on." 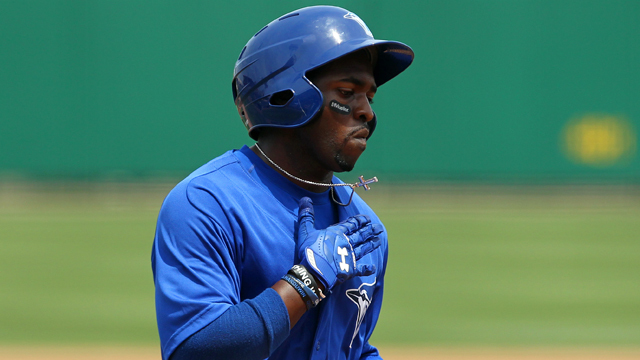 Smith, a 5-foot-11 left-handed hitter, is in his first season with Dunedin and is 9-for-19 in his first four games. The 21-year-old spent last season with Class A Lansing, where he hit .284 with seven homers, 25 steals and a .752 OPS. Hamels threw four innings in the rehab start, allowing just the two earned runs on three hits. The left-hander struck out four and walked none. Toronto's No. 2 prospect Daniel Norris logged five one-run innings. The left-hander allowed five hits and struck out five in his 2014 debut. The 2011 second-round pick made one start with Dunedin at the end of 2013, putting together five scoreless frames for the Blue Jays.